Well, this marks the second August that we’ve spent working on the bus. That’s right, this project that we originally (ahem, naively) thought would take us six months to complete, has now entered its seventeenth month of ‘in-progress’ status. Collapsible bed fame with storage compartments below. Some fancy jigsaw work arround the door handle.. Both the DC and AC electrical systems are fully installed and functional. Let there be LED light! Just in case you were wondering about brightness… here’s a night-time shot. Floating laminate floor for the front and bedroom, vinyl tile flooring for the bathroom. Yay! Our bus finally has some proper walls in place. More photos of the full walls coming soon. 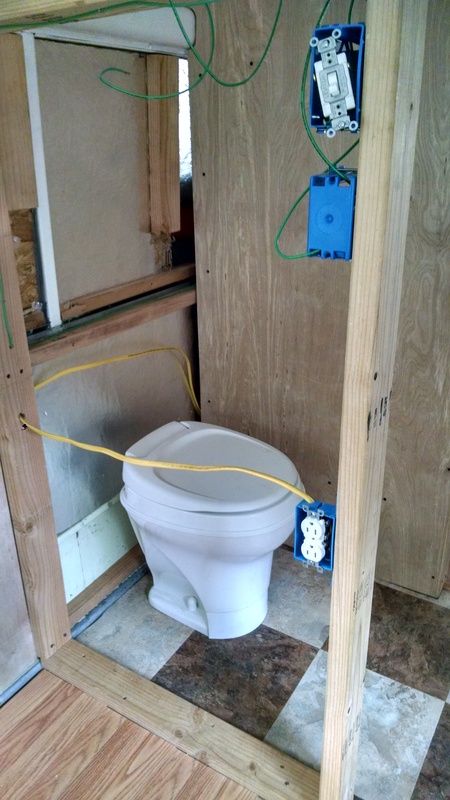 All of the internal plumbing lines have been run and the toilet has been affixed to the bathroom floor. Next up is hooking up the water inlet and storage tanks. Love seeing the progress! I especially like the floor. Looking forward to seeing it in person before too long! Wow, It really looks great. All the progress since I was there. It is coming together nicely. Can’t Wait to see it on the road with crickets head sticking out a window enjoying the breeze! Looking good! I’m anxious to see the finished product. I love reading these:) It looks so good!